It's Saturday morning, I've just finished making and enjoying Huevos Rancheros with homemade black beans and rice and I'm sipping the coffee, thinking of how nice it is to be able to relax for a day. Years ago I got to see part of a friend's collection and we took some pictures with the intent of sharing, having fun and ultimately, finding some more stuff. These pictures are from that day and they are of Frank Mizera Cheater Decoys (trout jigs/airplane jigs) and some cool colors of Mizera Decoys. The little boxes are from Dupont Blasting Caps that they used here in the Mines around the Iron Range. 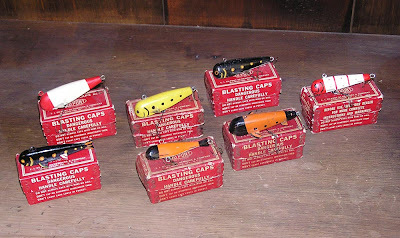 Frank would put his airplane lures in these empty blasting cap boxes. Sometimes if you're lucky, you'll see one sitting up near the rafters of a garage and inside, you'll find a never fished little trout jig. (Never happened to me, but I've heard stories) I have found a few empties. 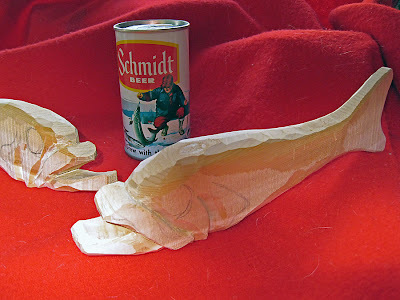 The silver fish that look like larger decoys were meant to fish for lake trout and they usually as a result of this design, have straight tails instead of curves (they didn't need to swim in a circle). 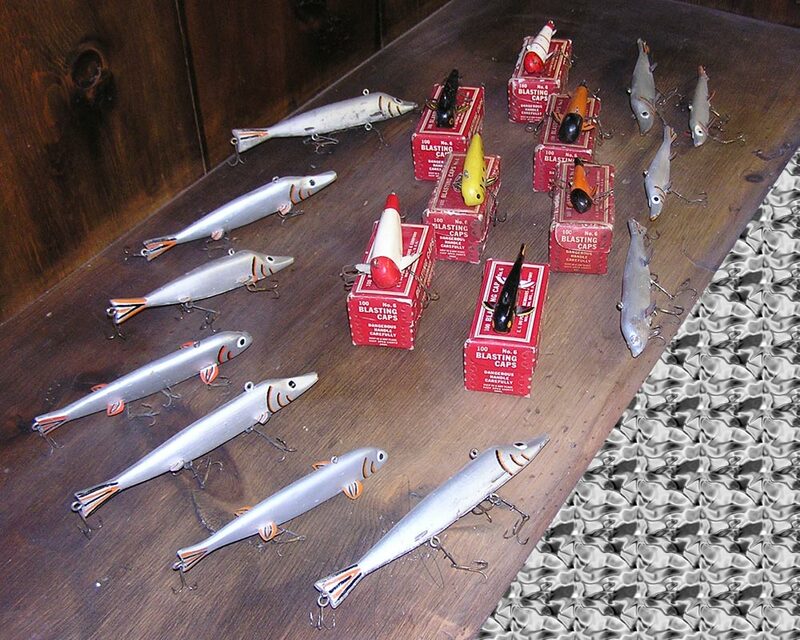 If you come across anything that looks like these, especially the black, yellow orange or other colors of the little cheater decoys, with smiley faces or without, I'm buying, just go to my website and shoot me an email or leave me a comment below. These silver fish with hooks have straight tails. Don't swim in circles. All of these dart through the water in big arcs. The little ones will "flutter"
Nice little fork tails, click for larger pictures. Got some? I'm buying! Got a call the other day. "Come look at some trout jigs, can't use em anymore." So off I went. Nothing outstanding to report in the way of wood, but I did find this nice red and white with a smiley face and horse hair tail that is most likely the work of Frank Mizera. 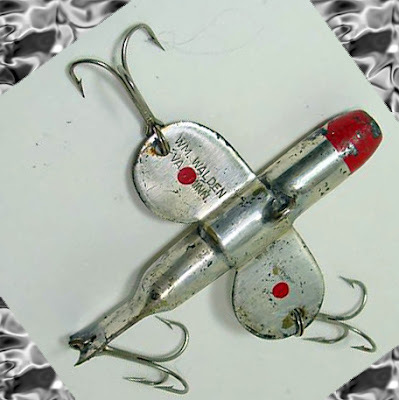 With it was a classic William Walden "bullet" lake trout airplane lure in brass. Tagging along for the ride is a rather large unknown black and white cheater decoy that has a trailing stinger. It could be from "LEE's" but I'm not positive about that. So, not exactly what I was hoping for, but nothing to sneeze at either. I was happy and met someone new. Can Frog Decoys Swim Circles? Most Frogs glide straight through the water and boy do they glide if you weight them correctly. 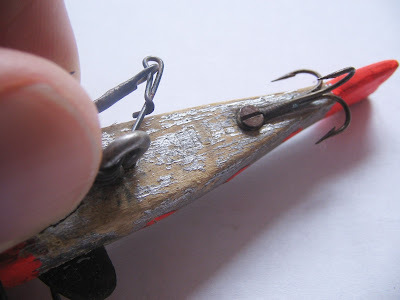 You can lead them with your jig stick and line of course, but they still glide back and forth more than they swim circles (mostly due to their legs out the back... why many people connect the legs at the feet and angle the feet one way). 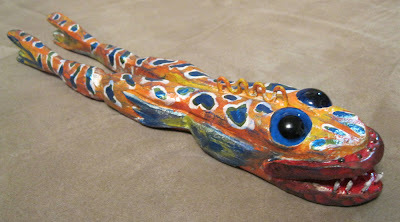 I like making frog fishing decoys and I've come up with a few different designs that actually swim in a circle like a regular "fish" fish decoy. This particular frog accomplishes that with the addition of a tadpolly tail. I made him with jointed legs and after all was said and done and drilled and weighted and re-drilled and re-weighted (there's a lot of wood in them thare legs)... Well, these legs don't stay level as he swims, the kick up and down and actually give him some pretty darn close to real frog kickin action in the water. I had fun taking these pictures and even put some blue food coloring in the ole bathtub water. I'm getting a little soft water envy, been thinking too much about topwater lures lately I guess. It's going to be a while before all these slushy lakes melt. Many times on Ebay and other places you'll find a very similar lure to Frank Mizera of Ely, Minnesota. Sometimes they are wooden and sometimes they are plastic. It is my understanding that they are made by a company in Virginia, Minnesota. 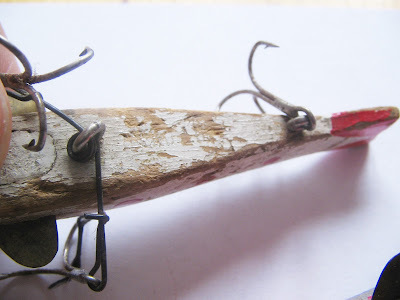 That company is said to be the same company as William Walden Lure Company, Virginia Minnesota that made metal trout jigs shaped like bullets with rounded wings, cheater hooks and forked tails. The wooden trout jigs are stamped into the wood on the belly, AERO LURE. 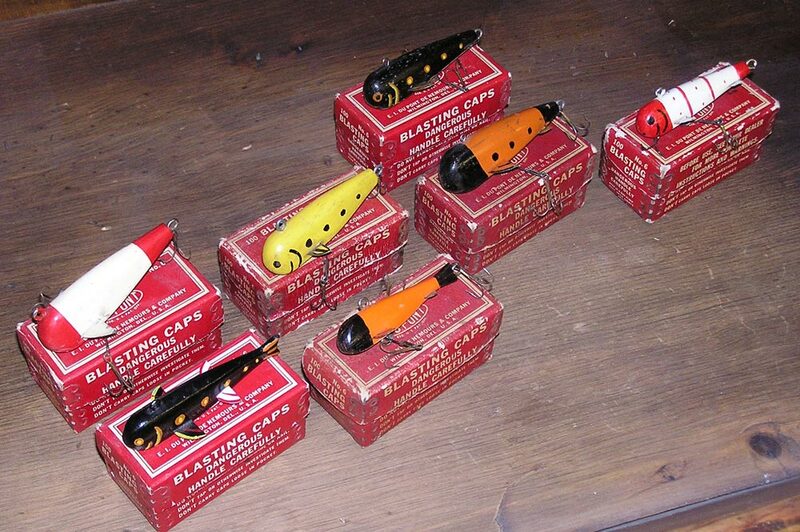 I've shown two examples of lures that still show stamps. They are hard to see. I've had other examples that clearly show the stamp when more paint is present on the belly. The differences most apparent are the wider, less detailed fork in the tail. Mizera's narrowed quite a bit right before the fork begins. While the lead pour in the bottom is similar the fins on the AERO lures are rounded much more than Mizera's fins. The normal fins on a Frank Mizera trout jig or cheater lure have a perpendicular straight edge to the body. 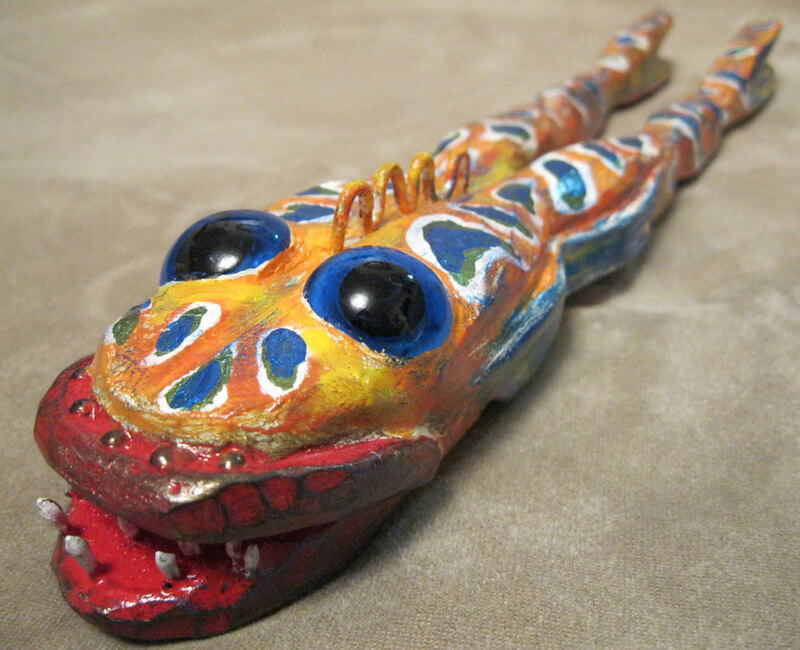 His fins commonly were painted with alternating colored stripes like his decoys, although not always. The dots down the side while nearly always present on AERO LURES are only sometimes present on Frank's cheaters. The noses on the AERO lures are normally less pronounced and narrower than Mizera's jigs. 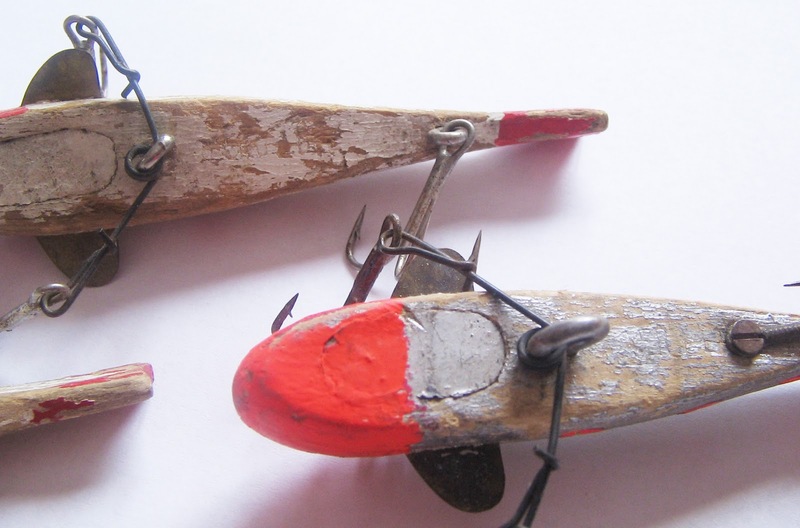 The AERO LURES when pictured together (two or three or more) all bear the same nearly duplicated body shape and fin placement, fat in front and narrowing (look underneath). 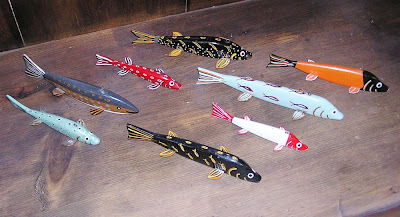 These lures are always very similar because they were mass produced and most likely carved with a duplicator machine as other lures were. Frank Mizera's lures each have a unique shape, although similar through style and muscle memory, they were each hand carved and hand painted. I hope the pictures below help. 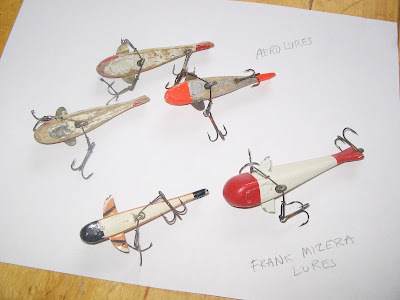 While I may be sketchy on some of the commercial fishing lure company's details, I'm 100% positive that these lures were not made by Ely's Frank Mizera. I've handled and own enough of the real thing to know the difference. Mizera did not stamp or sign his decoys or lures. His style was his signature as with most old timers. Why so similar? 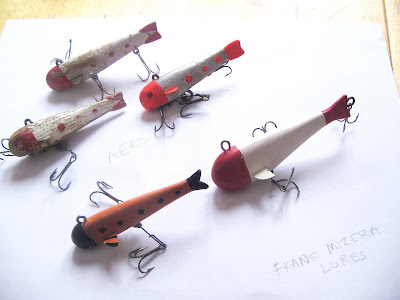 Well, as with any good, successful design, these are lures that worked when fishing for lake trout, their are 100s of similar "airplane" jigs or airplane lures that I've seen and found in tackle boxes all over Northern Minnesota. I've got an extensive collection of unknowns that have similar qualities to each of these lures. If you run across any, I'm interested in buying, especially several pieces by the same maker and pieces from Frank Mizera and Johnny Novak of Ely. I'll showcase some of my Novak airplane jigs at another time. Each of these guys made metal jigs as well. That's a story for another time. 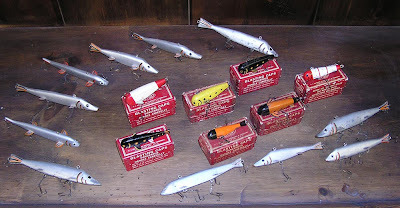 The picture on my header showcases the folk art fishing decoys of Frank Mizera from my home town, Ely, Minnesota. Frank was a guide and sold his decoys and trout jigs to his friends, commonly for $1.50 each. Barbershops, hardware stores and friends carried them. The tails were delicate and he used cedar. 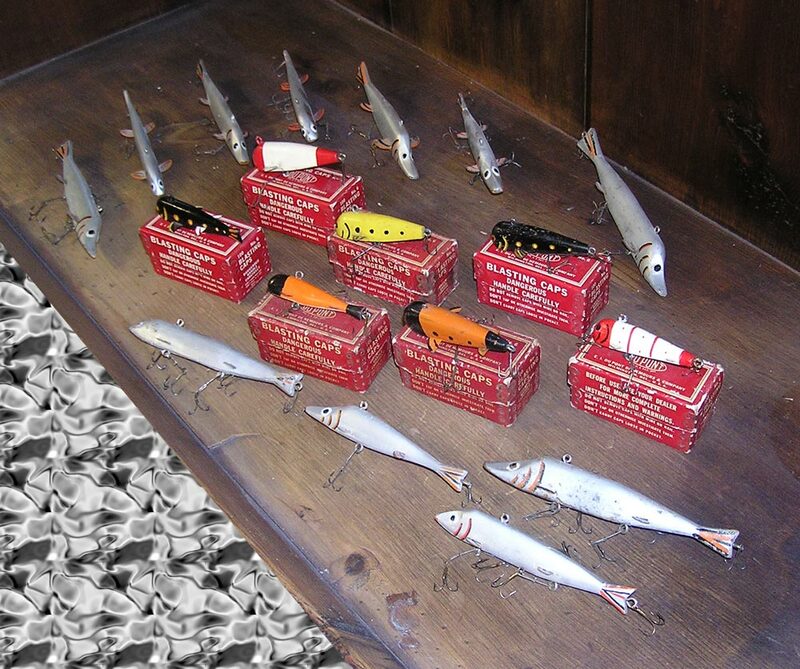 This photo includes a rare original metal tail decoy that was very far from the norm. 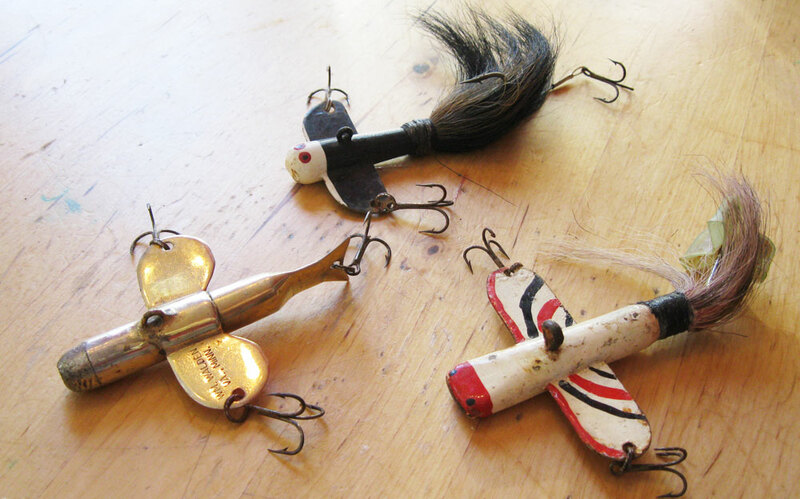 There are also a couple of metal trout jigs and a wooden trout jig (cheater decoy) with a dressed hair. 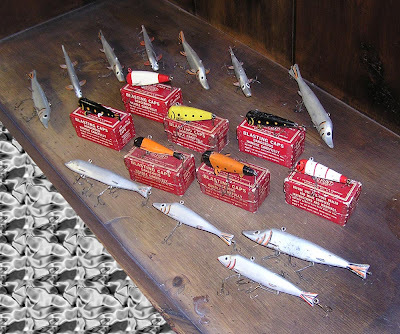 Present as well are many cheater decoys, used here predominantly to fish for lake trout. They are range from early, to barber pole striped, to orange and finally unfinished wooden blanks. 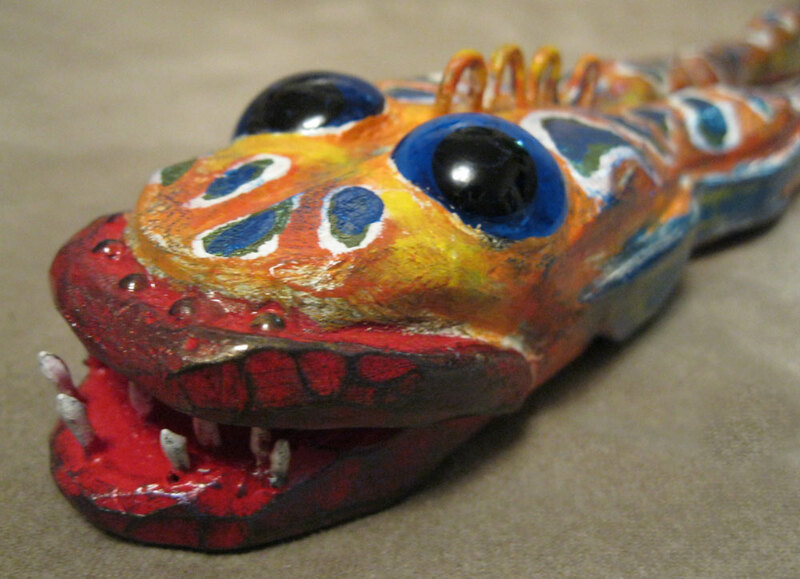 A rough very small and very early decoy is missing much of its paint. 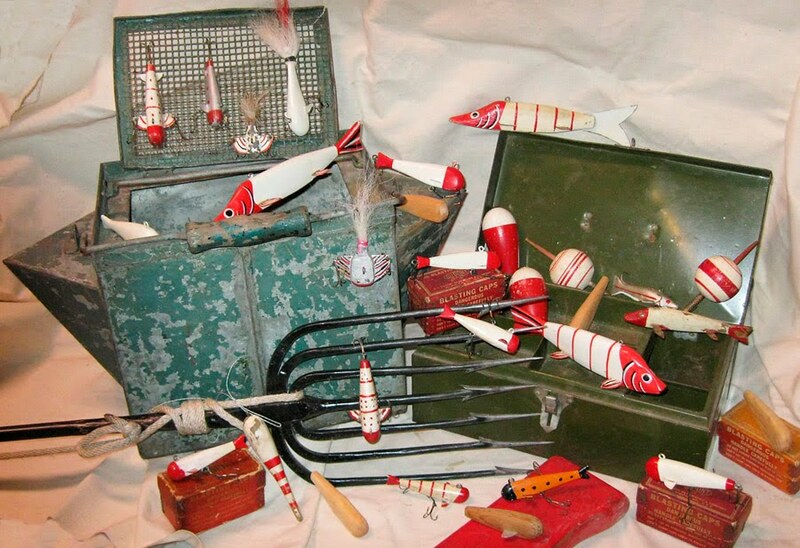 I like red and white the best even though his fish of other colors seem to be much more valuable to collectors. The old bobbers keep the theme going. The spear is a Pimple. 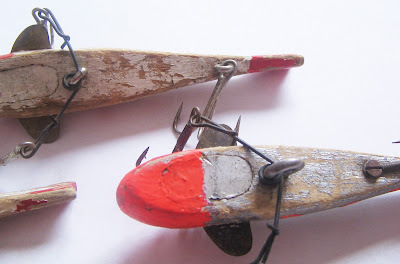 If anyone knows anything about the minnow bucket/box with the twin triangular metal floats, I'd love to know. Found it in Ely. Frank Mizera died in 1969. 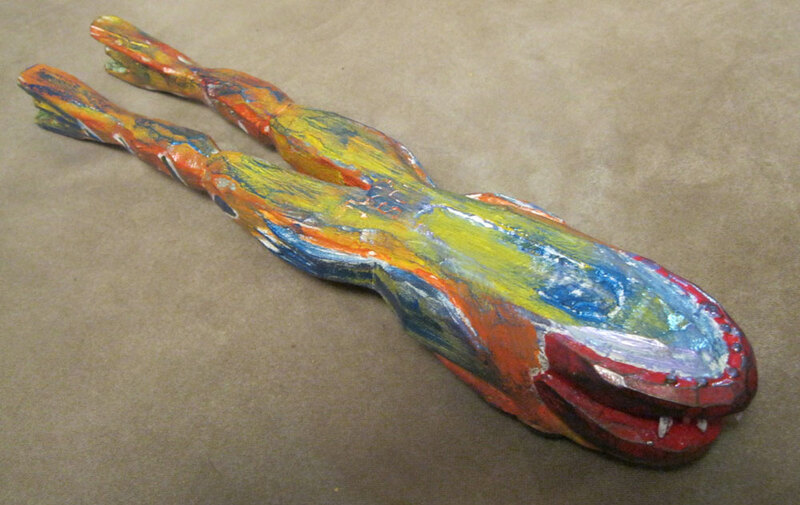 He continues to be an inspiration to the carvers and collectors that love darkhouse spearing decoys. Fish Decoys I'm Currently Working On. Here's a couple of decoys I'm working on now. These are from locally harvested white cedar that has been drying in my garage for 5 years. Nearly all of my work is hand-painted, though I've been experimenting with an airbrush a little of late. I've been putting this off long enough since I had planned on starting long ago. I don't know what to project onto this space, because that's not how creativity sneaks out of you. I like folk art lures and decoys. 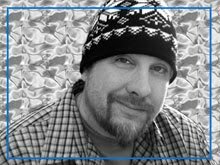 I've been in the antique business since I was a kid, when I opened our first shop in rural Illinois with my parents. At ten I sold my first piece, a heavy old stove I bought at an auction for 3 bucks while my dad wasn't watching. :) It sold for $30 and I was hooked. 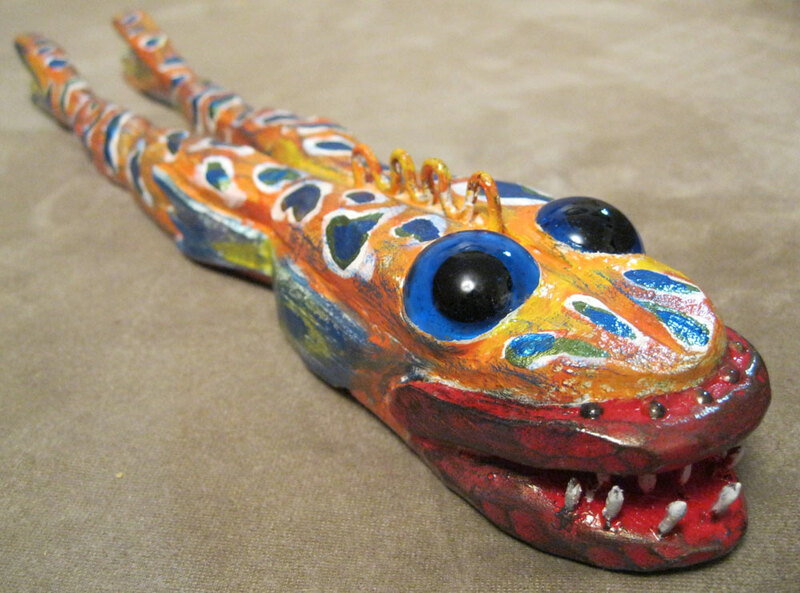 Speaking of hooked, the love for antiques and history led me eventually to collect and then to create. Sometimes people like to share their fondness for this kind of thing. Occasionally we like to compare and learn about other collectors passions. So... reader beware... fishing decoys is what you're in for.